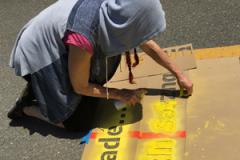 In 2018, Arlington Public Art and the bike committees of Arlington, Lexington and Bedford collaborated to celebrate the 25th Anniversary of the Minuteman Bikeway with 10 miles of haiku poetry created by our diverse communities and stenciled onto the pavement. Once a railroad line, the Minuteman is one of the busiest bikeways in the U.S.; it runs through town centers, residential communities, scenic greenspaces, and nature sanctuaries. We received more than 460 haiku poems through a submission process that was open to all. Anyone who uses and appreciates the Minuteman Bikeway could enter. We encouraged submissions from writers of all ages, as well as writers of any cultural background. All submissions had to be original and unpublished. Writers drew inspiration from diverse aspects of this local treasure. Some poems focused on birds and animals encountered on the Minuteman. Others captured stories of human interaction. Some were animated by humor, others conveyed a hint of sadness. All haiku had to be three lines long. Although English-language traditions and contemporary poets use various syllable counts, for this project we requested a composition with 5 syllables in the first line, 7 in the second, and 5 in the last. You can read all the haiku received here. 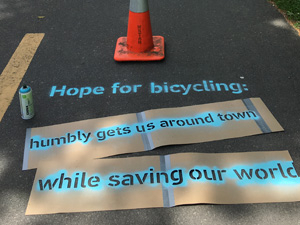 A Selection Committee of three poets – Charles Coe, Grey Held, and Gloria Mindock – picked 111 haiku for installation along the 10 mile Bikeway route through Arlington, Lexington and Bedford. Not an easy job; you can read a little about it in the Arlington Advocate. Artist Liz LaManche made a stencil for each poem using chip board and a lasercutter at Technocopia, a maker space in Worcester. You can see more of Liz’s work, including her public art, at her website. 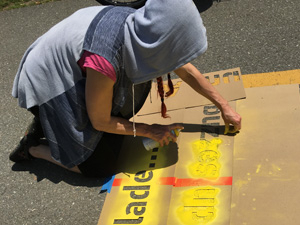 Teams of volunteers used a temporary chalk-based spray paint to stencil the poems in all three towns. 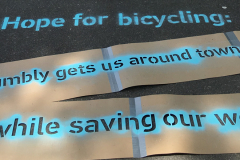 Bikeway Haiku was unveiled on September 29th , 2018, in time for a celebration of the 25 th anniversary that included live music, a “type-in” gathering where people could write new poems on vintage typewriters, and a reading of the haiku poems. Unfortunately, an exceptionally rainy October washed away the poems in about a month; although the project was planned as temporary, we were hoping for a little longer! expand this to other storefront locations interested in hosting poetry. 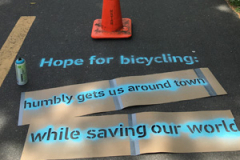 We plan to reinstall Bikeway Haiku in Arlington in July of 2019. Stay tuned for details. Haiku is a Japanese poetry form that often calls attention to small, closely observed moments in the human and the natural worlds. Haiku writers often recall a moment of beauty; however, they also use humor, a shift in mood, or unexpected juxtapositions to create a surprise in their poems. Although haiku can be read quickly, these short poems can offer ideas and images to take away for longer reflection. We selected haiku for this project for these qualities and because it will give writers with different interests, perspectives and life experience a shared form to express diverse points of view. The Bikeway, and your experience of it. The Bikeway is an extraordinary resource, one of the first (and most heavily used) rail-to-trail paths in New England. Originally a train route, its conversion to a bike route preserved a public way and miles of greenspace and habitat for birds and animals. The Bikeway travels through busy town centers as well as beautiful and inspiring natural places. It changes with the seasons and time of day, and everyone experiences it differently. This project invited people to take some time to notice what is going on around them on the Bikeway, reflect on favorite places, vistas, or encounters. Bikeway Haiku is an opportunity for the Haiku writers to share their experiences and insights with neighbors, just as we share the road.